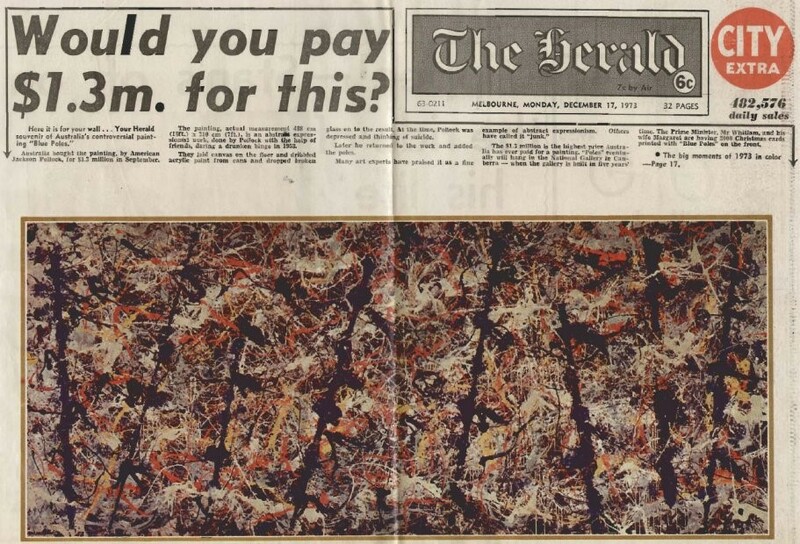 “Would you Pay $1.3m for this?”, Herald, 17th Dec, 1973. I’m in no way suggesting that we are yet to see an abstract painting. I’m saying that there is no appetite for that as an un-compromised artistic pursuit in our current prevailing culture. Rather paradoxically, we have a situation where there are more “abstract painters” than ever before, but just as so many of these painters are capable of pulling off some rather good paintings, many are just as capable of drawing a smiley face into one of them the very next day. This is because there doesn’t seem to be any sense that a critically engaged audience is watching. Casualism is to a great extent born out of a perception that no one actually cares. This is very different to the climate that gave oxygen to the painters in your survey, Alan [Gouk], and from what I can gather, quite different to the critically engaged times you yourself came up in, able as you were to exchange ideas and have your work seen by the likes of Greenberg and Fried. The tide may already have been turning then, but it is at its lowest ebb now. The fact that we have to resort to google to try and find new or interesting artists is a massive indictment on how far things have fallen, and how isolated we all are. … transportation got rid of the dissenter without making a hero of him on the scaffold. He slipped off the map into a distant limbo, where his voice fell dead at his feet. There was nothing for his ideas to engage, if he were an intellectual; no machines to break or ricks to burn, if a labourer. He could preach sedition to the thieves and cockatoos, or to the wind. Nobody would care. Eerily familiar. Barbarism aside, the most significant difference today, as I see it, is the repeated assurance that our voices matter and will be heard. The world has shrunk, so they say, and we’re all supposedly much more connected, and yet it feels as if we’re all just shouting over the top of each other, silencing ourselves in the process, creating a new breed of repression. In colonial Australia, repression was the local currency. We have always felt like this, and it contributes to the manifestation of The Cultural Cringe, that peculiar, archaic but ever present inferiority complex, the reverence for the ‘homeland’ suffered by post-colonial nations but particularly Australia. It’s a complex that has impeded our cultural development, devaluing everything we make here in favour of almost anything from Europe and America, because of our insecure and guilt ridden view of ourselves, born out of the knowledge that this isn’t really our country. This is Simon Gardam’s second solo exhibition at Fort Delta in little over a year, and in such a small space of time his work has undergone some significant transformations. The addition to Gardam’s repertoire of stitching paintings together is but one reason for this, and certainly not the most important when it comes to determining just how these paintings go about engaging us in a way that is very different to the last few years. I think the most consequential factor for bringing about this shift lies in the colour and how it sits on the surface. Gardam’s colour is brighter now than it has been in recent years and that has a lot to do with the immediacy of its application. 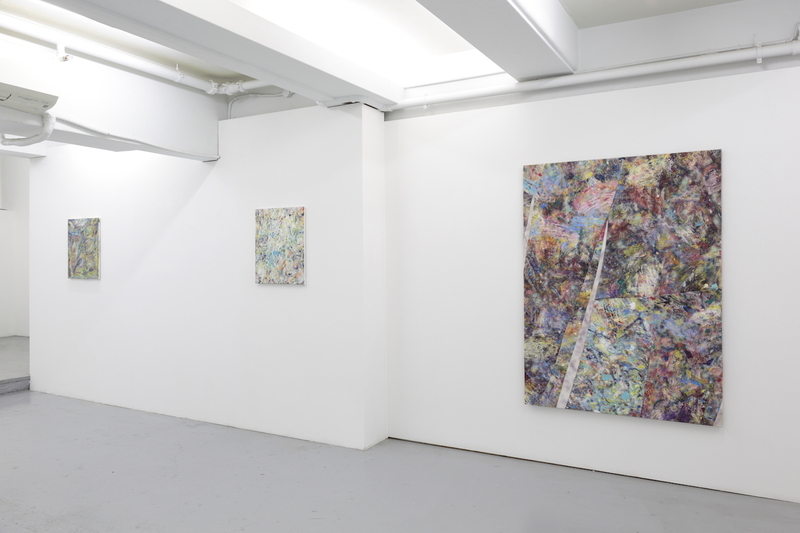 Traces of older methods are still evident as well, able to co-exist with these newer developments, all in all contributing to a diverse selection of works, with physical and spatial differences occurring across all the paintings in this current exhibition, Field.